The 170 metre cove slopes gently and comprises of sand, backed by steep cliffs on the west to Nell's Point, with a harbour wall on the east. It faces south east towards the Bristol Channel and is backed by the highly urbanised town of Barry. The water quality sample point is located at the centre of the bay. Natural Resources Wales is continuing to work with the Vale of Glamorgan and Dŵr Cymru Welsh Water to establish sources of pollution that are adversely impacting the water quality around Jackson’s Bay. Inspections are carried out by Natural Resources Wales in partnership with the Local Authority. These are carried out pre-season (before the 15th of May) and mid season if required (during the bathing water season). 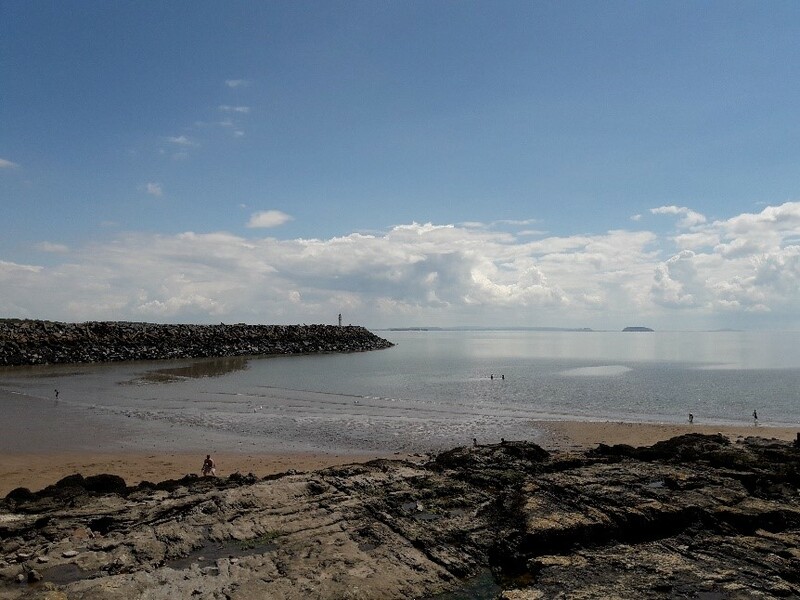 The program of investigations to identify the sources of bacteria that impact on bathing water quality at Jackson’s Bay from the River Cadoxton’s catchment is continuing, with issues such as small housing estate misconnections being identified and resolved. Within the catchment of Jackson’s Bay bathing water, there are numerous storm, emergency and surface water outfalls that discharge into the River Cadoxton and the harbour. These protect domestic properties in Barry from being flooded by sewage during heavy rainfall. However, sewer overflows operating during and following periods of heavy rain can result in a deterioration in the quality of bathing water at Jackson’s Bay. In recent years, screens and telemetry equipment have been installed in most overflows and pumping stations by Dŵr Cymru Welsh Water. The use of telemetry systems allows Dŵr Cymru Welsh Water to respond to warnings of blockages in the sewerage system, reducing the number of actual and potential overflows. A project known as Event Duration Monitoring (EDM) is underway to install telemetry on Combined Sewer Overflows (CSOs) within 2km of a bathing water by 2020 so that Dŵr Cymru Welsh Water (DCWW) know when the CSOs are operating and can work to reduce spills. Fourteen CSOs near Jackson's Bay Barry Island are included in the project. Dŵr Cymru Welsh Water has invested a significant amount of money to upgrade the sewerage infrastructure in the Barry catchment, under the Asset Management Programme. The five year rolling programmes are developed by Natural Resources Wales and Dŵr Cymru Welsh Water to bring about water quality improvements and comply with environmental legislation and European directives. In 2009, an ultra violet disinfection treatment plant was installed at Cog Moors Sewage Treatment Works to disinfect storm discharges from this site. It is believed these upgrades will improve bathing water quality in the area. Natural Resources Wales will continue to work with Dŵr Cymru Welsh Water to make further improvements to the sewerage system, where necessary. Natural Resources Wales and the Vale of Glamorgan Council have been working together to improve the bathing water quality at Jackson’s Bay for a number of years. Information is being shared to develop a combined approach to resolving issues impacting the water environment. Streams are typically affected by sewage or industrial run off from further up the catchment. Jackson’s Bay is influenced by the fresh water of the River Cadoxton, small streams and surface water drains, which discharge to the sea in and around the bay. These can intermittently be a source of reduced water quality, after heavy rainfall depending upon the prevailing wind and tidal conditions. Cog Moors Sewage Treatment works, serving the Barry and Cardiff West catchments, discharge to the Bristol Channel, via a long sea outfall, off Lavernock Point, to the east of Jackson’s Bay. Disinfection through ultra violet treatment of the storm effluent further reduces the environmental impact from the treatment works and protects the bathing water quality. Natural Resources Wales samplers make visual observations of the beach at every visit. This includes assessments of sewage debris, animal faeces, litter and oil or tar. At Jackson's Bay Barry Island, data are available for the four year assessment period from 2014-2017. Sewage debris was observed in trace amounts on over thirty per cent of occasions and in greater amounts an additional four times. Trace amounts of animal faeces were noted at the site on a minority of occasions. Trace amounts of litter were observed at the bathing water the majority of the time and in greater amounts on less than ten per cent of additional occasions. Litter was sufficient to be objectionable on one occasion in May 2014. Oil and tarry residues were not noted at this site. The natural drainage (hydrological) catchment surrounding the bathing water is highly urbanised with commercial buildings in the immediate vicinity. The River Cadoxton meets the sea 1 km east of the Bay. This may also influence bathing water quality, depending on tidal currents and weather conditions. The River Cadoxton drains a large and diverse catchment. In the lower reaches, there is a combination of large residential areas and heavy industry, along with several small industrial estates. Towards the top of the catchment, the land is largely rural, which is not intensively farmed.